The idea of becoming a vegan wasn’t difficult for me until I had to confront the fact that I was giving up cheese. I really loved cheese. And yogurt. And ice cream. Okay… I loved pretty much all the dairy. I’d been vegetarian since the age of eight, but I could hardly imagine life without my favorite yogurt, big bowls of cereal in milk, or burritos laced with cheesy goodness. But when I picked up this book in college and found out how horrific the dairy industry was, I decided that however hard it may be, I had to become a vegan. While it would probably be better for site views if I had a dramatic story about dropping cheese from my diet, the whole thing was pretty, well, uneventful. Since cheese is basically just fat and salt, I started using avocado with salt as my go-to cheese replacement for most dishes (burritos, sandwiches, and beyond). Later on, I started using nutritional yeast (a.k.a. “nooch”), and before I knew it dozens of delicious vegan cheeses came to market. But of course, just as I realized that cheese was this big paper tiger—totally daunting at first but not actually a very big deal, I started to realize that this whole “vegan learning curve” thing was a lot steeper than I’d anticipated. Not only did I have to let go of my beloved cheese (easy! ), but I had to figure out how (and where) to grocery shop. I had to find a whole new collection of satisfying recipes. Discover how to navigate social situations (like what-the-heck to do when you go to a restaurant and there’s nothing vegan on the menu). And so much more. It was a bit overwhelming, to say the least. Going vegan can certainly feel challenging at times, but having good guidance, camaraderie, and support makes all the difference in the world. And that’s exactly why I started this website. World of Vegan now exists to be the vegan resource that I wish had existed when I first went vegan. …and more. Whether you’re thinking about becoming a vegan for health reasons or because you care about animal welfare, I want to help you make your transition to a vegan diet as easy as possible. If you stick with it, I promise that before you know it, those initial struggles will completely fade away. That’s why we put together this handy guide to going vegan. 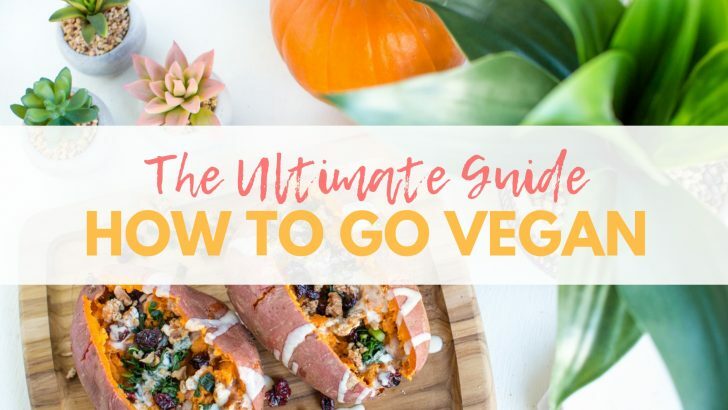 Spoiler alert: It’s pretty long, but that’s because we wanted to this to be an exhaustive guide to going vegan. With the help of this guide you can spend more of your time experimenting in the kitchen or championing your favorite vegan-friendly causes than scouring the web for trustworthy information. We’ll be covering a lot in this guide, which you can see outlined below. If you’re here for just a few key pieces of information, feel free to jump to the sections that are most applicable to you. Go forth! Is Going Vegan For You? Have Fun & Enjoy The Journey! Is This Plant-Based Thing Really For Me? We’re going to take a little leap of faith here and say yes :). A vegan diet is an excellent choice for people of virtually all ages and backgrounds. From high-performance athletes to families with little ones. Whether you want to go vegan for health reasons, spiritual reasons, for ethical reasons, or some combination thereof, choosing vegan is a great fit for all. But to show you that the reasons for going vegan are as a diverse as the people following a vegan lifestyle, we thought we should share some anecdotes that World of Vegan reader shared on Instagram about why they chose to go vegan. Here is our step-by-step guide that will make the process of becoming vegan so much easier. Follow these 10 steps and you’ll be feeling strong in your resolve to stick with your delicious, healthful plant-based diet. You’ll feel ready to handle any left hook that life throws at you and any awkward social situation that comes your way. Now…let’s do this! Every year, there are people who try to go vegan overnight, or on January 1st, or some other arbitrary date. And that’s not good for your health or your happiness, and it’s certainly not helpful to animals or our planet. Instead, resist peer pressure and adopt a vegan diet at a pace that’s comfortable for you. It’s much better in the long-term if you “officially” become a vegan on a random Tuesday in March with ample preparation than on a whim on January 1. If you’re having trouble thinking of ways to gradually adopt a vegan diet, then you can try some of the following. Eat a vegan diet one day per week, then gradually transition to two days a week, three days a week, etc. If you think of going vegan as “giving up” foods and meals you love, you’re setting a negative mindset. You’re telling yourself “I can’t” all day, every day. That’s no way to live, honey! Instead, try the opposite approach. A positive, upbeat, glass-half-full approach! This approach is based on “crowding out” your old go-to foods and ingredients with exciting new foods and recipes. Explore new fruits and veggies you’ve never cooked with before. Add new vegan-friendly restaurants to your must-visit list (this may include cuisines that are entirely new to you, such as international cuisines that are notoriously vegan-friendly). Get a couple vegan cookbooks and start playing with recipes (more on this in Step #5). Before you know it, you’ll have so many plant-powered foods you love that going vegan won’t feel like a sacrifice at all. We’ve said this many times before, but we’ll say it again: There’s no such thing as a perfect vegan. Cravings, peer pressure, and even honest forgetfulness have all caused even the most mindful vegans to consume some non-vegan from time to time. I’ve been there more times than I can count. You can remove animal-based products from your diet as much as you like, but there’s still a very good chance that you’re either ingesting, using, or otherwise negatively impacting other living creatures even if you’re a vegan. For example, you may think that your dark chocolate bar is totally vegan. But the FDA allows a small amount of insect fragments and rodent hairs in chocolates. Yep, insect fragments and rodent hairs. Now, this doesn’t mean for sure that your chocolate bar will contain these items, but they are legally permitted to contain small amounts of these and be sold commercially. So now you’re probably saying to yourself that you’ll avoid store-bought premade foods and eat whole foods only. Well, there’s a good chance that the vegetables you buy from a farmer’s market or major grocery store were grown using animal manure. Even if you stumble upon a farm that uses only dirt with nothing else added to it, part of that dirt will be comprised of deceased and decayed animals. And even if you’re a vegan who, say, forages for all of your food and doesn’t wear animal fibers, you may still be negatively impacting other animals inadvertently. For example, you may accidentally step on insects while walking down the street, or frighten animals in their natural habitats while hiking or foraging in the woods. We don’t bring these things up to make you feel bad about not being a perfect vegan, or make you feel like you must be a hyper-vigilant vegan or else you’re not “worthy” of calling yourself one. Instead, we simply want you to know that achieving perfection as a vegan is not possible in today’s world. Veganism is a diet and lifestyle that centers around compassion—and call us crazy, but it’s a little nonsensical to show so much compassion to others when we’re so unforgiving on ourselves. We’ve all hear it before: Knowledge is power. And when it comes to going vegan, it’s absolutely true. If you don’t take the time to study up, you’re going to be thrown for quite a loop when your friends and family start grilling you with the inevitable annoying questions every vegan is asked all the dang time (like, where do we get our protein?). So learn, watch, read, and educate yourself as much as you can. Books and documentaries are a great place to start. You can check out our round-up of must-read books and documentaries you should watch. The more books you read, the more documentaries you watch, and the more educational podcasts you listen to, the more knowledgeable and empowered you’ll be. When you adopt a vegan diet, or really any diet that differs from the Standard American Diet (aptly dubbed the “SAD” diet), it feels like a lot of people suddenly become intensely concerned about your health. While many of those people do have your best interests at heart, most people out there are not certified health professionals, or even lay people who have a sound background in nutrition and dietetics. So instead of worrying about what your relatives or random people on the street have to say about your health, take control of your situation and start researching health information on your own. There are several books out there all about vegan nutrition, which will equip you with all you need to know about plant-based diets, and then some. A few books we recommend are Vegan for Life, Vegan for Her, and Even Vegans Die. Read these books, and it’s likely you’ll know loads more about nutrition than even your primary care doctor. Speaking of which, please don’t go to your medical doctor expecting them to have a vast knowledge of nutrition. Many if not most doctors have very little nutrition training. Registered Dietitians Are There For You! If you’re looking for nutrition advice from a medical professional, you can always meet with a registered dietitian who is experienced in plant-based eating. Your doctor should be able to refer you to a registered dietitian, and we have an entire guide to vegan registered dietitians that can help you understand what to look for in a dietitian and find one who is a perfect fit for you. Disclaimer: I’m not a doctor, and the information presented here is not to be construed as medical advice or used to diagnose, treat, cure or prevent any condition or disease. Being a vegan means that you can (and should) eat more than just salads and coincidentally-vegan foods (we’re looking at you, Oreos). But it certainly doesn’t mean that every meal you make has to be an Instagram-worthy dish packed to the brim with every nutrient under the sun. To find a realistic balance and avoid running into a food rut, you’re going to need to start building a collection of amazing plant-based recipes. The first step? Invest in a few great vegan cookbooks. If you can’t afford to buy cookbooks, not to worry! You can visit your local library and check some out there, or find infinite recipes online from vegan bloggers (and of course here at World of Vegan). Just be honest with yourself. If you’re a busy person, then there’s no shame in finding vegan recipes that you can throw together in 30 minutes or less (that’s what we specialize in here at World of Vegan). If you’re quite the foodie and love to spend time getting creative with unique ingredients in the kitchen, there are blogs and vegan cookbooks that are made for you. Be sure to check out the World of Vegan Pinterest boards for lots of vegan recipe inspiration pinned from all across the web. And if you’re more of a person who likes personality and a story with each recipe, check out some of our favorite vegan bloggers below. Wouldn’t it be awesome if each week you could sit down for an hour or two and plan an amazing week of vegan recipes for yourself, and then spend a few hours in the kitchen artfully putting together your next Instagram-worthy food masterpiece? We don’t know about you, but we just don’t have that kind of time—and we’re guessing that you probably don’t, either. To save yourself the hassle of trying to figure out how to plan (and shop for) nutritious and appetizing meals each week, we recommend turning to meal plans. It takes out a lot of the guesswork out of what you’ll eat each week, saving you both time and money. 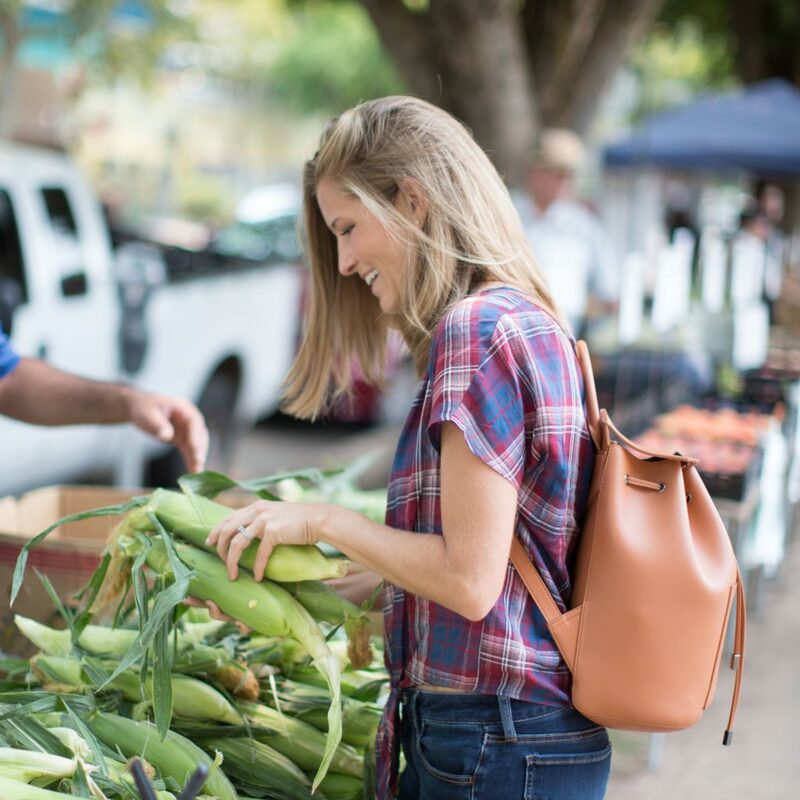 If you love the process of exploring and selecting recipes, organizing agendas, and compiling ingredient grocery shopping lists, then by all means, go to town designing your own meal plans! You can easily find free printable meal plan calendars online to use as a template. But… if you don’t have time for that, let someone else do the work and get a pre-made meal plan online. Check Out Our Vegan Meal Plans! We have one-week meal plans that show you how to cook delicious, healthful plant-based meals on a super-tight budget. We’re talkin’ as little as $25 for the entire week of groceries! These meal plans come with printer-friendly grocery shopping lists, beautiful photos of every recipe, and lots of tips for saving time and money on your meals. You walk into your kitchen and open the fridge jonesing for a snack. You see your favorite yogurt, string cheese, and salami slices. With this kind of temptation in front of you every day, of course it’s going to be a challenge to go vegan! If you’re able, pick a weekend to give your kitchen (especially your pantry and fridge) a good, clean makeover. Get the crappy foods you don’t want to be eating outta’ there! In their place, stock your pantry with these vegan pantry essentials and quick grab-and-go vegan snacks. Stock your fridge with fresh ingredients and a few of these specialty foods that can be used to whip up delicious meals. Stock your freezer with some frozen vegan entrees that you can turn to in a pinch. Plus, load up on lots of frozen fruit for smoothies, and maybe even a tub of vegan ice cream for when you need a treat. If you’re living in a household with a shared kitchen and you just can’t convince your housemates to join you on this vegan adventure, I’m sending you extra willpower. Stay strong. Yes, it will be harder. But know that in time, once you get the hang of this vegan thing and “crowd out” your old favorite foods with the most delicious new favorite vegan foods, those meat and dairy foods that were “so tempting” at first won’t even look appealing anymore. Other than that, that’s there’s very little difference between a vegan kitchen and an omnivore’s kitchen. 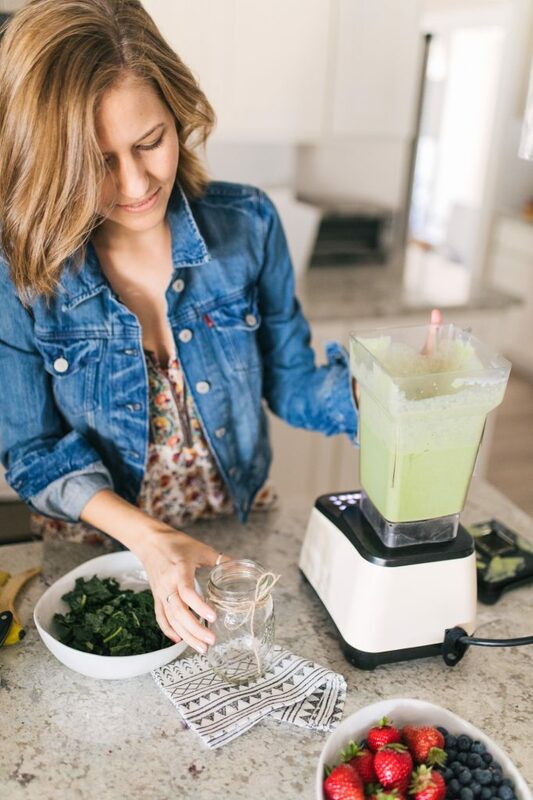 But if you’re planning on following a plant-based diet, there are several kitchen tools and vegan pantry essentials that we recommend in order to make your meal preparation much easier. While you won’t need all of these tools and foods as soon you go vegan, we do recommend investing in them as soon as you’re able so that you can cut down on time spent on food prep. Beans, which are arguably the most versatile vegan-friendly food out there. You can use them to make hummus and other protein-rich spreads, toss them in your soups for extra nutrition, load them in quick-fix burritos, or even use them to make brownies. An egg alternative to bind your baking recipes together. Options include ground flaxseeds, bananas, applesauce, chia seeds, or a commercial egg replacer such as Ener-G.
Nutritional yeast, also fondly known as “nooch,” to add a nutritionally-rich cheesy flavor to your vegan cheeses and cheese-based dishes. Nuts and seeds so that you can use to make nut milk, nut butter, nut-based cheese, and even just to snack on. Cashews and almonds are arguably the most versatile nuts to keep on hand, but you can often substitute other nuts with little change in flavor. Vegetable stock or vegetable bouillon cubes to use as a base for vegan soups and stews. 8. Experiment In The Kitchen! Now that you’ve got some essential tools in hand, it’s time to start experimenting! This is the fun part. The vegan cookbooks you ordered on Amazon have arrived on your doorstep. They’re waiting for you to start flipping through the pages, making notes, and splattering ingredients all over them. Be sure to test out several breakfast recipes, lunch recipes, and dinner recipes (ideally before becoming a full-time vegan) for a few reasons. Firstly, it’s important to find recipes that you would actually want to eat versus what you want your ideal vegan self to eat (we’re all guilty of this!). And secondly, while most vegan meals are quite straightforward to cook, there can be a learning curve when you’re trying to veganize your favorite foods. Know this: not everything you make will turn out great. Even today, 10 years after becoming vegan, I still have lots and lots of recipe flops. I print off recipes that look oh-so picture perfect on Pinterest and they end up looking like total sludge when I try to bring them to life in my kitchen. That’s okay—and trust me, it happens to everyone, not just us vegans. Power on, and appreciate that this will make it extra exciting when you do find those recipe gems that work perfectly every time. Those perfect recipes are out there, and now it’s your challenge to find them. I bid you good luck on your adventure! That’s why you need a community. Whether you need to talk to people who “get it” because you’re surrounded by people who don’t, you’re having really bad hamburger cravings, you feel like you’re in a dietary rut, or you just want to feel like you’re not alone, you need a community to support you. Vegan Restaurants (Head to a vegan restaurant and enjoy the feeling of being surrounded by people (and staff) who “get it.” Start conversations—you never know who you’ll meet! 10. Have Fun And Enjoy The Journey! One thing is certain: when you first become vegan, there will be a lot of excitement ahead of you. Like…when you find your first vegan cupcake on a grocery store shelf! Or when your old favorite pizza shop starts offering vegan cheese (it will happen—give it time!). Or when your uncle tells you he wants to be around for as long as he can so he’s finally giving up meat and jumping on the plant-based bandwagon (I’m still dreaming about this one, hehe). Discovering New Vegan Foods Is Exciting! Things that were just plain ordinary before (Oh boy, another holiday cheese platter. Womp-womp.) are suddenly explosively exciting (OMG, you made an all-vegan cheese platter?!?! I LOVE YOU!!!). Enjoy these moments. Like with any new relationship, the thrill and excitement comes hand-in-hand with the challenge and the unknown. As vegan living gets easier and easier for you, those new vegan finds that once made you do a literal happy dance in the middle of the grocery store, will instead become normal, everyday life. Let’s Crush Those Vegan Myths! Depending on who you ask, becoming a vegan is either an extreme decision that will make you terribly unhealthy or the one-and-only way to live a lengthy and healthy life. Well, neither of those things is entirely true (although going vegan can do wonders for your health!). But it’s time we answer some common questions and debunk popular myths about going vegan. We aren’t licensed healthcare professionals, but we do think it’s entirely possible to be a vegan on almost any income level or at any age. With the proliferation of vegan-related blogs and websites in the past decade, it’s quite easy to find advice for would-be vegans in virtually every stage of life (from pregnancy to the bitter end, as is covered in the book Even Vegan Die). Going vegan, just like any other lifestyle and dietary choice out there, requires just a little research and planning to ensure your long-term happiness and health. Yes, you can. It’s entirely possible to eat a well-balanced vegan diet on a budget, especially since you don’t have to shell out money on expensive cuts of meat or blocks of cheese. Plus, many of the most affordable foods on the planet are vegan! Think: rice, beans, oats, carrots, and bananas. These are all extraordinarily healthful foods that can help lower your cholesterol, clear out your arteries, and save you money in the bank. Transition foods make it super easy to switch from a Standard American Diet to vegan without having to change much at all. But in time, try to move off the packaged foods and toward much more budget-friendly (and healthful!) whole foods. Need help? There are entire websites and multiple books dedicated to showing you how eating vegan on-the-cheap is done. Don’t quite believe us? Then check out our easy-to-use Plant-Based on a Budget Meal Plans that show how to eat vegan for a grocery budget as low as $25 a week (that’s just $1.20 per meal). Can’t afford to be vegan? Honey, you’ll be able to save up for your dream vacation if you follow these meal plans! Um, have you been on Pinterest lately? There is such a thing as being a “raw vegan,” but you don’t have to eat exclusively raw foods in order to follow a vegan diet. Just a quick search on Pinterest will reveal thousands of recipes for cooked soups, baked goods, casseroles, roasts, and more that all should be cooked before being eaten. While it’s entirely your choice if and how much raw food you eat as a vegan, exclusively raw vegan isn’t necessary in order to follow a vegan diet. While of course we all need protein to thrive, there’s this crazy myth that the sole (or “best”) source of protein is meat. Not quite true. All plants contain protein, and just like elephants, cows, and gorillas, we can get all the protein we need exclusively from plants. If you’re not eating enough calories and only eating highly-processed nutrient-depleted junk food, then sure, you might end up protein-deficient. But protein deficiency (also known as “kwashiorkor”) is very rare in developed countries. It’s mostly found in areas of famine. If you’re like most of the sensible vegans out there, you know that to be healthy on any diet, you need to eat a well-balanced diet and be cognizant of your nutritional intake. 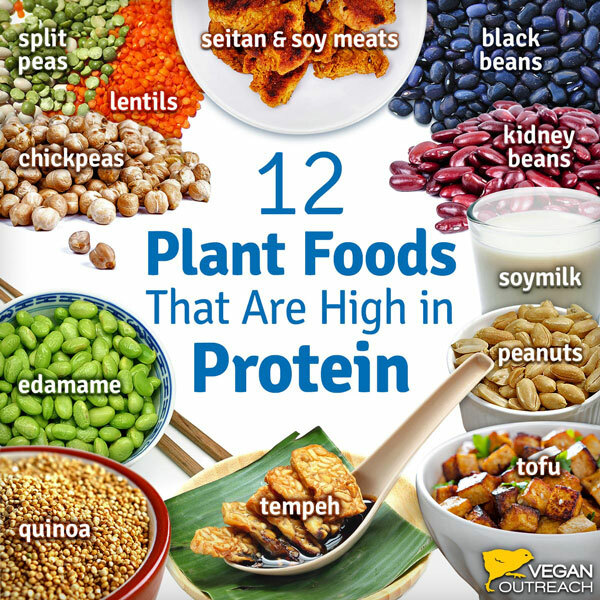 You can see some of the most protein-rich foods that you can incorporate into your diet in the graphic below. 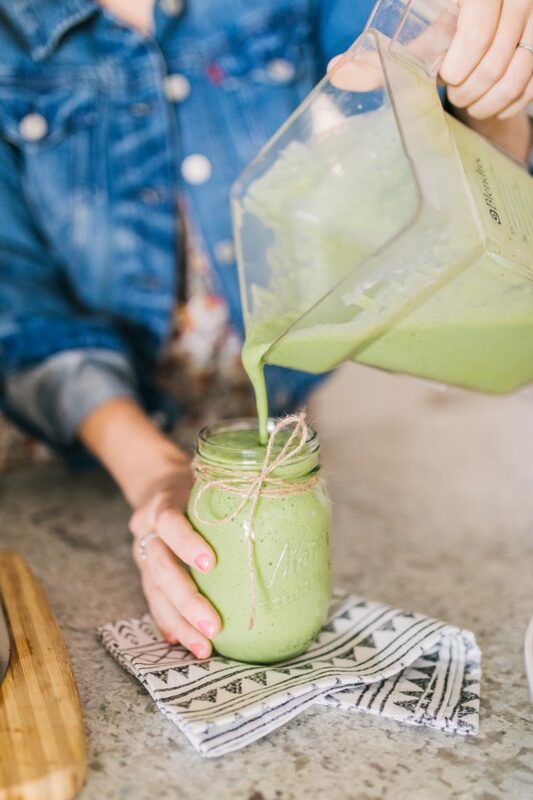 If you’re concerned about your protein intake (or focused on bodybuilding), you can always add vegan protein powders to your smoothies or consult a registered dietitian! There are some nutrients, like Vitamin B-12, that aren’t found in plants or in much smaller quantities than you could find in animal-derived products. But as we mentioned before, it’s entirely possible to follow a healthy and nutrient-rich if you simply do some research into your dietary requirements. Besides, you can always take dietary supplements to cover your bases. It sounds like it’s time for you to find some new restaurants! Not only are there thousands of vegan restaurants opening around the world, but we’ve also seen more and more chain restaurants offer vegan options in recent years. There’s a good chance that you’ll find at least one vegan item on the menu. Simply search “vegan” on Yelp or Happy Cow wherever you are, and it will pull up vegan-friendly eateries near you. This will help you find great vegan restaurants to explore near your home and when you’re traveling. Happy Cow is like a vegan version of Yelp that’s also available as a cell phone app. If you don’t see any items that are explicitly listed as vegan on the menu, most restaurants will gladly substitute meat for a plant-based protein source and non-vegan sauces and dressings for vegan-friendly ones. You’ve just touched on one of our favorite topics: Vegan shopping at major grocery stores! Sure, stores like Whole Foods tend to cater to more health-conscious consumers and typically have a wider array of vegan-friendly foods. But it’s entirely possible to shop as a vegan at major supermarkets like Costco, Target, Walmart, and Trader Joe’s, especially if you’re a budget-conscious consumer like us. Just check out our vegan grocery shopping guide! I’ve gone on several food expeditions to show that it’s entirely possible to shop as a vegan at major supermarkets and wholesale supermarkets. In fact, we’re constantly astounded at how many yummy (and affordable!) foods we find on our shopping hauls! We recommend checking out some of our food haul videos below to see just how easy it is to shop as a vegan at major supermarkets. Don’t see a supermarket you frequent? Then shoot us an email and we may feature it in an upcoming video! Every person, every action, every choice makes a difference. The question is not whether or not we make a difference—it’s whether the difference we make on this world is positive or negative. We vote with our dollars. With each product we buy and each meal we eat, we vote for the kind of world we want to live in. We vote for or against factory farms. For or against slaughterhouses. Do you want to see organic foods? More sustainable practices? Corporate transparency? Then go vote with your dollars. The dollars we spend at the grocery stores and at restaurants are all little votes that we cast every single day. Cast your votes wisely, my friends, as they truly do make an impact! The terms “plant-based” and “vegan” are often used interchangeably. While there is a lot of overlap between vegan and plant-based diets, the two aren’t exactly identical. Both “vegan” and “plant-based” diets eschew all animal-based food products, including meat, dairy, and eggs. But each involves different reasons for moving away from the Standard American Diet. The label “plant-based” is typically used to describe someone who is eschewing animal products for health reasons. The label “vegan,” on the other hand, is used by those who adopt an animal-free diet for ethical, environmental, or social justice reasons. “Plant-based” simply describes a diet comprised wholly of plant foods. “Vegan” is a compassion-based do-no-harm philosophy. Plant-based eaters are generally more concerned with their wellness, while vegans are concerned with conscious consumerism—the idea that we should be conscious about what we’re buying and choose products that are aligned with our ethics and values. Am I Plant-Based or Vegan? Those who identify as vegan often extend that philosophy to other aspects of their life as well, including clothing, beauty products, and household products. Vegans often avoid wearing animals (in the form of leather, wool, and other materials that cause great suffering and/or environmental destruction to produce). Many also ensure that their cosmetics and household products are ethically sourced and have not been tested on animals. Someone who identifies as “vegan” might eat sugary cupcakes all day without an ounce of guilt because they are cruelty-free cupcakes that were made sustainably without causing harm to others. Someone who identifies as “plant-based” could be a passionate hunter clothed in bear-hide about to shoot a fawn’s mom without remorse. They likely became plant-based to improve their personal health and longevity (perhaps after watching a documentary like “What The Health” on Netflix). Their diet is likely closer to the “Whole Food Plant-Based” (WFPB) diet based on unprocessed fruits, veggies, grains, legumes, nuts, and seeds. The Whole Food Plant Based diet is considered by many to be the healthiest diet in the world. Yes, You Can Be Both! Of course, many individuals identify as vegan and plant-based because they’re driven by compassion as well as health and wellness. That’s where these labels can become confusing and interchangeable, as both apply! Are you in college and thinking of going vegan? Well, you’re in good company. College students all around the globe are eagerly embracing the power of a plant-based lifestyle as a way to take a stand for our planet, for animals, and for human health. I too, went vegan in college. When I was 8 years old, I became a passionate vegetarian. As a vegetarian, I thought my values were fully aligned with my food choices. But in college, I got a serious reality check about what’s really going on in the dairy and egg industries. I’ve always wanted to live a life in which I make the world a better place. To “be the change I wish to see in the world.” So as I became aware of the injustices I was contributing to by eating animal products, I knew I needed to make a change. To adjust my food choices to fit my code of ethics. And so, as a Sophomore college student at Case Western Reserve University in Ohio, I became a vegan. It wasn’t instantaneous—it took me a few weeks to transition from vegetarian to vegan. I had to acclimate my tastebuds to soymilk instead of cows milk and use up all the dairy yogurt and cheese in my fridge. But once it was all out of my home, that was it. I’d never again intentionally purchase animal products. I’m not going to lie, it was hard at first. I was a college student on a tight budget, without a car or easy access to the most vegan-friendly grocery stores, and I had no idea what I was doing, what foods to buy, or how to cook. I turned to the internet and the local vegan community for guidance, and before you know it, being vegan became second nature. It was actually fun! It’s Hard At First, But It Will Get Easier! Going vegan is a lot like learning to ride a bike. You know it has many advantages over walking, but it’s hard and scary at first. Learning to ride is really hard—you may need training wheels at first, and you’ll likely fall down a few times before you’re feeling really confident and ready to speed down the steepest hills. But before you know it, bike riding becomes second nature, and you can barely remember life any other way. Becoming vegan is similar—there is a steep learning curve but once you learn the ropes, it’s easy. And it’s well worth the initial effort, because it’s better for your own health and longevity, it’s better for our planet, and of course it’s better for animals. Okay, I know what you’re thinking. You went vegan 10 years ago! Your advice is sooooo not relevant today. I get it. And that’s why my co-host Toni and I brought a current college student, Felicia Falconer, onto the Plant-Powered People Podcast to talk about what it’s like going vegan in college today. You can listen to this episode below (or on iTunes, Spotify, or wherever you listen to postcasts)! Learning from others will help you avoid many common vegan mistakes. So we turned to Instagram to crowdsource some tips to share with you! World of Vegan followers on Instagram kindly shared their advice and anecdotes about what they wish they had known before going vegan. There were hundreds of responses, but we picked out a few of our favorites! Our readers and community on Instagram are freakin’ awesome. We asked for tips and once again, hundreds responded with to share their tips to help you along your journey. So we’re closing this guide with a few of their inspiring and encouraging words of wisdom. And that’s a wrap! I hope you found this guide helpful. Do you have questions or tips about how to go vegan? Tag #WorldOfVegan on Instagram or Twitter so we can read all about it! This article was written in collaboration with Taylor Barbieri (aspiring vegan) and Michelle Cehn (founder of World of Vegan). We hope you’ll share this resource with anyone you know who could benefit from the guide! Reader quotes in the “advice for our readers” section were lightly edited for clarity and typos. The information presented in this article is not to be construed as medical advice. Please note that this article contains Amazon affiliate links, and shopping through these links supports World of Vegan! This article is not sponsored, and we only recommend things that we sincerely adore.